GBC 6BTM332 TIMING BELT. A070710SL Replaces OEM GBC Part 173054. Neoprene (Rubber) Timing Belt 173054 for GBC Digicoil Binders. Home > Specialty Belts > GBC Binding 1981401 Belt. Clearance priced! > GBC Binding 1981380 Belt. Clearance priced! > GBC Binding 1981351 Belt. GBC AP2 Timing Belt. > A070710SL Replaces 6BTM332 TIMING BELT. Replaces OEM GBC Part 173054. *Neoprene* (Rubber) Timing Belt 173054 for GBC Digicoil Binders. 6BTM332 TIMING BELT. (A070710SL) Replaces OEM GBC Part 173054. 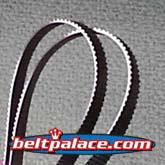 Neoprene (Rubber) Replacement Timing Belt 173054 for GBC Digicoil Binders. Replacement 6BTM332 TIMING BELT. 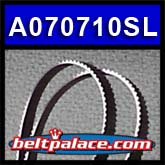 A070710SL Alternate Neoprene (black rubber) GBC Belt 1730543 for GBC Digicoil Binders. Neoprene construction Replaces OEM GBC TIMING BELT 6BTM332U for a fraction of the cost of Urethane! Neoprene has superior heat/oil and static resistance over urethane. Clearance Priced while supplies last! IN STOCK!